Rough estimates of the potential of fracking, as practiced in North-America, are that it can postpone the end of the oil age with perhaps a decade or so. 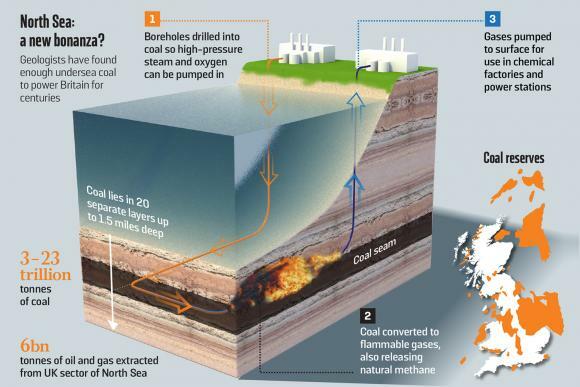 Scientists have discovered vast deposits of coal lying under the North Sea, which could provide enough energy to power Britain for centuries. Experts believe there is between 3 and 23 trillion tonnes of coal buried in the seabed starting from the northeast coast and stretching far out under the sea. Data from seismic tests and boreholes shows that the seabed holds up to 20 layers of coal – much of which could be reached with the technology already used to extract oil and gas. In comparison: so far the world extracted ‘merely’ 0.135 trillion ton of oil, a small fraction of the coal reserves located beneath the North-Sea. In other words: peak conventional oil may have happened in 2005, but in hindsight it was a completely irrelevant event. If it is wise to exploit these vast reserves is a different matter altogether. But one thing is certain: the original idea we had when we started this blog over three years ago, namely that fossil fuel could become scarce on relatively short notice, that idea needs to be abandoned. Limiting factors will more likely be: finance, geopolitics, war, environment, climate change; not lack of combustible material. It is likely that there is far more fossil fuel around than the atmosphere can ever handle. Obviously we do not advocate the grand-scale exploitation of coal underneath the North-Sea, although it is nice to know that we in Europe are perhaps not as dependent on the Middle-East for the duration of the transition. What we do advocate is the exploitation of a limited amount to enable the renewable energy transition to occur, meaning a large wind-turbine next to every village and solar panels on every available roof, combined with large scale hydro-storage in mountain areas. The EU should stick to its original goal of 100% renewable energy by 2050. Again: there is no serious energy problem in the long term. There is an awareness problem. This is the location we are talking about: North-sea/East coast of England where all the action could be (again) in the future.